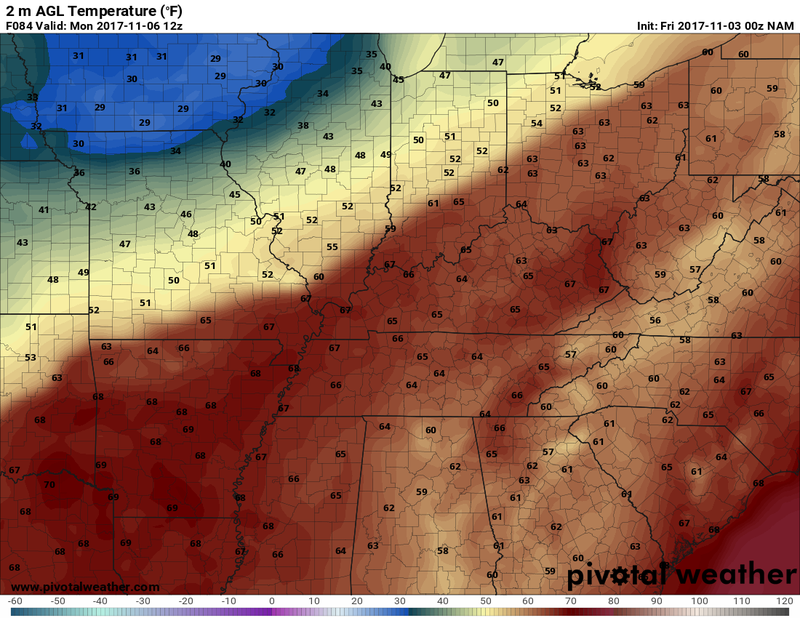 wxornotBG 11/3/17: Showers & storms this morning; drier, much warmer for the weekend. A cold front is bearing down on the region this morning bringing us appreciable rain chances to start off your Friday…this is payback for those pleasantly warm temperatures from yesterday…but don’t worry: more are on the way. But those will come with rain as well. The big player this weekend is going to be the frontal system moving through the region now. This front is sparking showers and storms this morning over our region. This is going to lead to intermittent rain showers throughout the morning and early afternoon as the front sweeps it’s way on through. Once the front passes, our winds will shift to a more northerly direction this afternoon and evening allowing us to cool to near 60º for an overnight low. And that’s about as cool as we’re going to get through this weekend. Today: Widespread showers and thunderstorms likely, with the greatest chance in the morning-to-midday time frame. Breezy with a high around 70º. At night, we remain mostly cloudy and only sink back to near 60º. While the pattern is taking a turn to more on the active side, we’ll see relatively quiet days for the weekend proper. The cold front that will pass through today will make a comeback to our region as a warm front, shifting the winds back to the southwest and allowing us to warm significantly. While the warm-up is on thanks to breezy conditions overtaking the region, we’ll stay mostly cloudy as moisture also returns to the region. That’s not to day we couldn’t also see some sun breaks, which could boost temperatures in certain locations. But overall, a boring but breezy Saturday. Tomorrow: Mostly cloudy, breezy and more humid with a slight chance of a shower. High topping out near 73º. We’ll fall back to only around 65º with mostly cloudy skies overnight. Mostly the same can be expected for Sunday, but those stiff breezes are winds of change because another front will be approaching us from the north and west and this one could be packing a punch. This front is bringing a threat of severe weather to the western Great Lakes region for the day on Sunday; for us however, we can expect an uptick in the breezy conditions, even more than on breezy Saturday. And that means even though it will be cloudy, we’ll still see temperatures well into the mid-70s. Rain chances will likely be on the rise for us after midnight. Thanks to the dynamics with this front, we cannot rule out a strong storm or two late Sunday night into Monday morning. We’ll be watching this possibility throughout the weekend. Sunday: Mostly cloudy and slightly breezier with a high topping out at about 76º. Rain and storms become likely overnight as the low falls to only around 67º. A couple of storms could be on the strong side. Mostly socked in with clouds on Saturday and warming up with southerly breezes. Sunday stays cloudy as well as breezy and warm. Storm chances rise overnight with a couple that could be on the strong side. That just about does it for me! Thanks for checking into wxornotBG this morning, and be sure to follow @wxornotBG and @WKUweather on Twitter and like Landon Hampton on Facebook for the latest weather throughout the day. Have a terrific Friday!